Unfortunately, since social networks have become an instrument to spread xenophobia, hate, and abuse against minorities, the need to combat hatred comments online is increasing. How to recognize online hate speech especially against migrants and refugees? How to oppose to online racism? Therefore, “Hate speech against refugees in Social Media” provides an overview of “what can specifically be done if once again racist hate speech is encountered on the internet”. Published as a part of the federal programme Demokratie Leben!, and funded by Federal Ministry for Family Affairs, Senior Citizens, Women and Youth, the brochure has been created by the no-nazi-net team, and it is addressed to anyone interested to combat racist hate speech online. 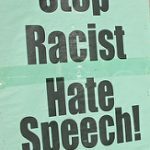 The study investigates different ways for countering racist hate speech, trying to answer to some fundamental questions about the issue. It focuses on how to identify xenophobe hate speech and how to manage it through self-protection and empowerment.